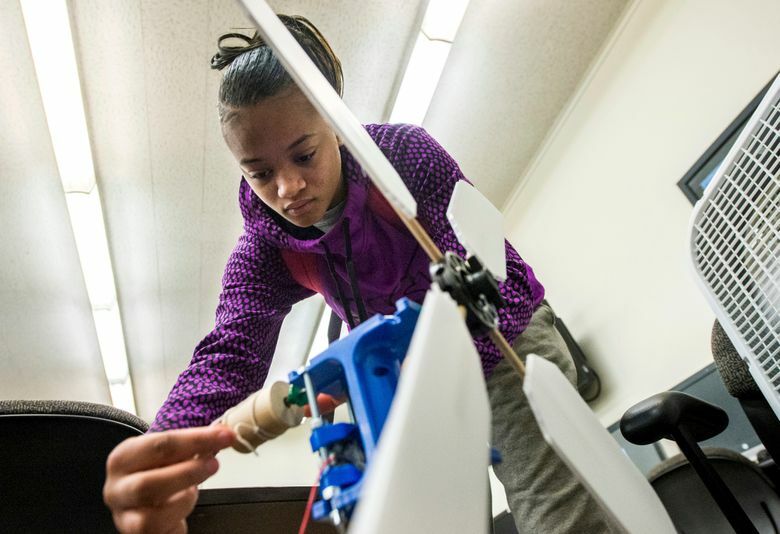 PEORIA, Ill. (AP) — Jakayla Wright steps back and looks at the small windmill she just built. It’s supposed to use wind energy to lift a small bucket. But the windmill is hardly turning, much less generating wind energy. “I can tell you what I did wrong,” she tells teacher Greg Gilson, then begins to correct her mistake. Styles Stuckey is across the room, sprawled on the floor, trying to figure out why Sparki, a two-wheeled, toy-like robot, won’t turn when it’s supposed to turn. Stuckey gets up, walks over to a row of computers behind Wright’s windmill, and checks the coding sequence he’s written into the computer. “90-degree turn left, then eight centimeters, 90-degree turn to the right … ” Stuckey says to himself as he checks and rechecks how he coded the turns. Failure is an opportunity in Gilson’s first-hour class, the FUSE studio. There are no assignments, no classroom lectures, no traditional grades. Instead, students select what they want to do from a buffet of 30 computer-based experiments, or challenges, in science, technology, engineering, arts and math (STEAM). They work at their own pace, in groups or alone. Some complete a challenge, then, as in video games, move on to similar but more difficult experiments. Others jump from one project to the next, not necessarily moving beyond the basic level of any. The self-driven learning and the video-game model are by design. “When kids drive their own learning, they tend to be more engaged,” Gilson says. Manual is one of 136 schools in the United States and Finland equipped with a FUSE interactive learning lab. Northwestern University’s School of Education and Social Policy launched the concept in 2013 after years of research on how students learn outside of school settings. 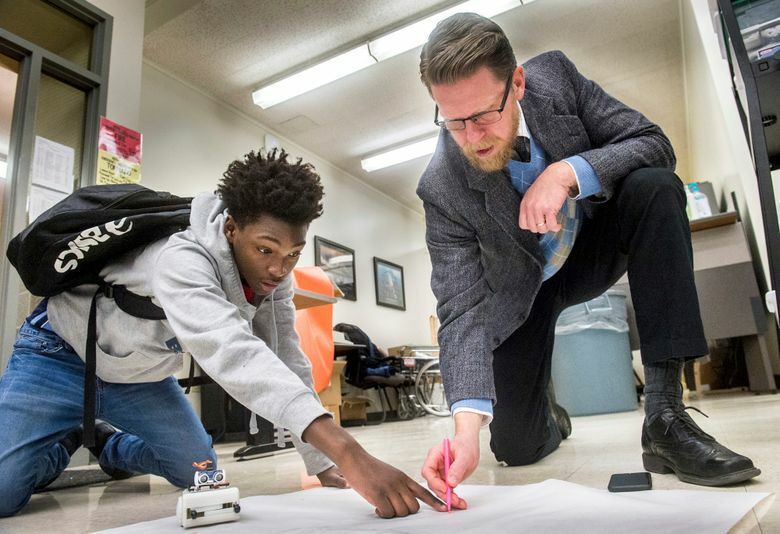 Earlier this year, Gilson was among only 23 applicants nationwide who won grants to establish FUSE labs at schools with high populations of low-income and minority students. The $26,000 grant supplied Manual with two 3-D printers, kits for each challenge, and the accompanying software. “At first, they were not used to being told, here’s a bunch of stuff you can play with, go play,” says Gilson. Challenges involving the 3-D printers quickly became the most popular. Students started with customized keychains. Some, including Adrianna Ingram, went beyond the basic designs available in the FUSE lab and figured out how to convert a 2-D image of a wolf’s paw to work on a 3-D printer. 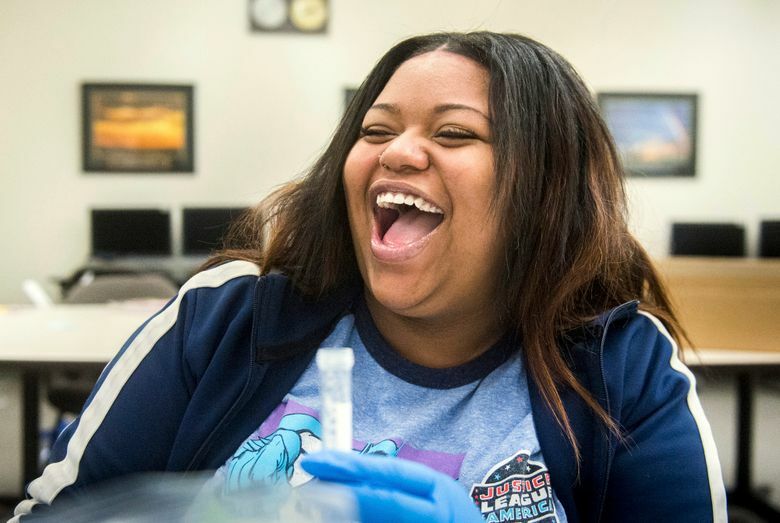 On a recent Wednesday, while Stuckey tried to make his robot turn and Wright worked on her windmill, a team of three girls mimicked bio-technology research using the same chemicals that research scientists use to simulate human tissue. One girl worked alone on an architectural challenge. Another boy couldn’t decide what to do. The 15-member class is the first to experience the FUSE studio and the first group in the school-within-a-school that began at Manual last fall. Most are making up credits in online courses so they’ll be able to graduate with their class. They remain in the same classroom, except for two classes and the FUSE studio. While they’re solving one problem related to graduation, they’re learning scientific problem-solving techniques in the FUSE lab. Wright corrects how the string is attached to the pulley and adjusts the blades’ angle on the windmill. Stuckey tries one more time, hoping his robot will follow his coded commands to make the shape of the letter P.
The robot goes straight, then turns, goes straight and turns again. “Did it,” Stuckey says to himself.